A series of apparently coordinated attacks rocked a hotel complex in Kenya's capital on Tuesday. An explosion tore through a bank in the compound at about 3 p.m. local time, then a suicide bomb detonated in the lobby of the nearby DusitD2 hotel, before attackers entered the hotel shooting. Authorities in Nairobi so far have released no official casualty numbers, but emergency responders and ambulances were at the scene. One witness told The Associated Press he saw five bodies at the hotel entrance alone. Interior Ministry Cabinet Secretary Fred Matiang'i said in a statement Tuesday night that the hotel complex had been secured. However, bursts of gunfire were still heard in the area, NPR's Eyder Peralta reports from Nairobi. Al-Shabab, the Islamic extremist group based in Somalia, has claimed responsibility. It's the same group that attacked the Westgate Mall in Nairobi in 2013, in which 67 people were killed. 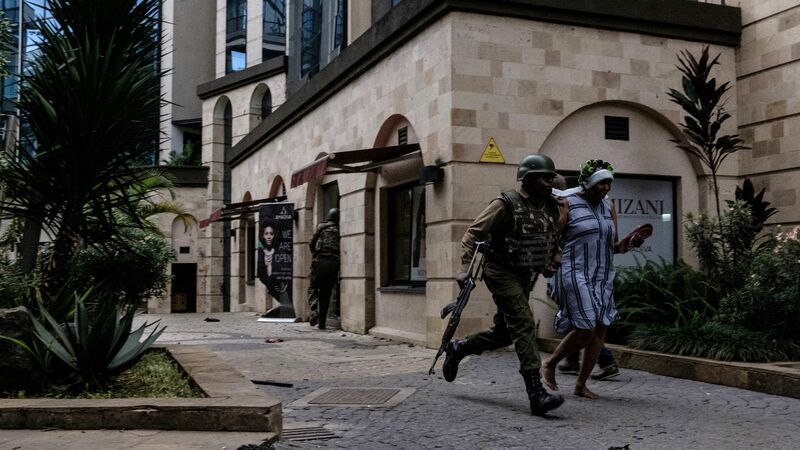 Similar to the Westgate siege, the attacks on Tuesday appeared aimed at Nairobi's wealthy residents, including foreigners. Visitors to the upscale hotel, which is located in a leafy area of the Westlands neighborhood, have to pass through two security checkpoints and an airport-style scanner. It's not clear how the attackers managed to infiltrate the complex. Reporter Halima Gikandi tells NPR that during the attack, people were "hiding in nearby buildings that were not attacked, and communicating with emergency responders who [were] trying to get them. I've spoken with family members of people hiding in buildings." She says helicopters were heard flying overhead and that armed black vehicles were seen entering and leaving the area, which had been closed off. One frightened witness, who only wanted to be identified as Ali, was in the hotel for a workshop. "We heard an explosion," he told NPR. "The whole ground shook. None of us really knew what it was, but I felt it was like a bomb." Enoch Kibet, who works as a cleaner at a cafe in the compound, managed to crawl out a basement gate. "We were changing our shifts, and that is when I heard a loud blast and people were screaming," he told the AP. "I couldn't believe I was alive. The blast was so loud and shook the whole complex." People were being escorted out of the complex at 14 Riverside Drive more than three hours after the attacks started, according to Reuters. The AP notes that the attack came a day after a magistrate ruled that three men must stand trial on charges they played a role in the Westgate siege. Kenya has been a target of Al-Shabab since Kenyan troops entered Somalia in 2011 and won back strategic territory held by the extremists. "The attack at Westgate Mall is just a very tiny fraction of what Muslims in Somalia experience at the hands of Kenyan invaders," Al-Shabab has tweeted in the past. In 2015, Al-Shabab militants attacked a university in Garissa, a city in eastern Kenya about 90 miles from the border with Somalia. Gunmen killed 147 people in the course of a daylong siege.